Today was all about working with Iglesias del Nazareno Vision Celestial, which is about 30 minutes from Santo Domingo. We spent the morning hearing from Pastor Ernesto and his wife Altagracia about the ministry, and we are amazed to hear all this small church does in the community. They teach 600-700 children, provide mothers with counseling from the beginning of pregnancy until a child is three years old, with 85 mothers currently being served. They have a water filtration plant that provides residents pure water for below market rates, and they also have a wholesale rate for resale by members to help provide for economic benefit of families. They have a bakery which is designed to provide financial benefit to the church as well as jobs in the community, and they are in process of starting a sewing school, which will provide government certifications for the students and provide for more economic opportunity for those who go through the school. This will help provide mothers with children in the Compassion International program the ability to better provide financially for their children. And it was such a blessing to hear how our team members who have been here before helped get some of these projects off the ground. It is an amazing testimony of faith and trust in the Father’s will. And they have even more vision beyond this to improve the community and provide better economic opportunities as they continue to share the Gospel of Jesus Christ. We are learning from them that they do not have to have all the pieces in place before they act. They act on faith. We were also blessed to hear from two young men who were once sponsored children in the program. One recently finished his education as a radiology technician, and is working with the local police. The police have a poor reputation in the community and he wants to be someone in the police department that the community feels they can trust. The other wants to study micro biology. In the afternoon we broke into two teams, one to do crafts and games with the children, and the other to provide labor for the new church building that is approximately ½ block away. But before we could do that, we were treated to a wonderful lunch of local fare. The food was excellent, and plentiful. We are treated so well and with such love and grace by the local community. We are blessed. 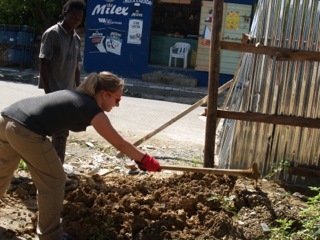 The team that went to the construction site helped clean up concrete forms and move soil to another location. In this culture the locals were fascinated to see Americanos working hard doing labor. At around 4:00 p.m., the kids are let out of school, the parents greet them, and the streets get busy and noisy. Our work became somewhat of an event to watch and observe by those in the community. We were often asked what we were doing and school children would stop and look. The other team stayed at the school and did crafts and games with 5-8 year old children. They made bracelets that represent the gospel, read Curious George in both English and Spanish, and played a bean bag game, Simon Says, and Duck, Duck, Goose. We are fortunate that some of our team’s sponsor children are in this program, and several got to spend time with their sponsored child today. The kids were also provided a meal and were all smiles by the end of the day. Today we got to see the evidence and examples of faith, and how strength in our shared weakness makes our partnership effective and successful. And in our shared weakness we find that we can safely build deep, intimate, intentional and long-term relationships both within and without our own culture; doing far more than what we can of our own accord, using our own self-perceived strength.